The lip-smacking lobster bloody mary. Photo from Boston Brunchers. Today I have been dreaming about bloody marys. Lobster bloody Marys to be precise. Below are a few places where you can order a lobster bloody Mary cocktail on the East Coast as well as several lobster bloody Mary recipes. If you come across any other lobster bloody Marys which you recommend or have a special recipe to share, do let me know! The Lobster Joint’s Lobster Claw Bloody Mary. Photo from Gothamist. The Lobster Joint Restaurant in New York (with branches in Greenpoint, Lower East Side and Rockaway Beach) serve a Lobster Claw Bloody Mary for the bargain price of $9. It comes garnished with celery, a pickle, olives and a lobster claw. This delectable bloody mary was recently voted one of the seven best bloody marys in NYC by Gothamist magazine. 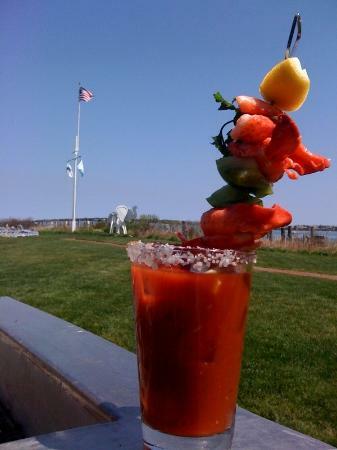 Nantucket Lobster Bloody Mary. Photo from Tripadvisor. 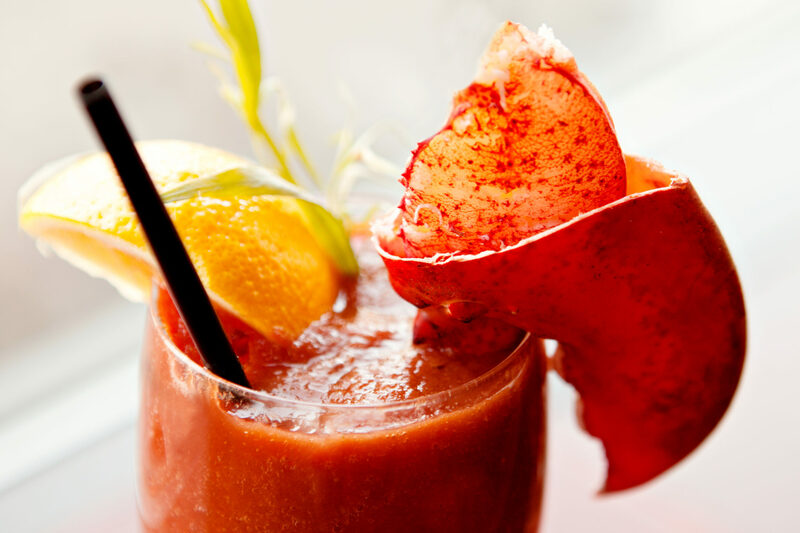 At the White Elephant Hotel on Nantucket Island you can order a lip-smacking bloody mary which comes garnished with a whole lobster’s worth of meat. Chef Fred Bisaillon, of the restaurant’s Brant Point Grill, shared the recipe for this amazing concoction with the Today Show and I am posting it below. Infusing vodka: In a sealable glass container, place two ounces of shredded horseradish in one liter of vodka and let mixture rest for two weeks. Separate lobster meat into four equal portions and set aside. Cut the lemon and tomatoes into four pieces each. Place one lemon wedge, then two ounces of meat on the skewer and a piece of tomato and then repeat with lobster and tomato. This will complete one of the lobster skewers, which will be used as a garnish. Repeat with the other three skewers. Set these aside on a plate in the refrigerator. Ice down your four pint glasses and pour one ounce of the vodka into each glass. Top with Bloody Mary mix and stir. Place the lobster skewers inside of each glass and top with the parsley. Enjoy. first recipe, from Bruno Loubet’s soon to open London restaurant, Grain Store, is for in infusion called the “Chilled Lobster Bloody Mary.” The press photo of this dish looks amazing and I look forward to trying it in person when the restaurant opens. Make sure the heritage tomatoes are at room temperature. To make the tomato water, quarter the vine tomatoes and add to the blender with the celery stick, basil, sugar, sherry vinegar, fennel tops, horseradish, salt and pepper. Liquidise until smooth, then pour into a muslin cloth, in a sieve, over a bowl. Close the muslin tightly with a piece of string and leave over the bowl for the liquid to slowly drip through. After half an hour, put a small plate over the muslin parcel and place a 1 kg weight on top to help compress the juice. Check the seasoning and set aside. Bring a large pan with 2 litres of water to the boil and add 1 tablespoon of salt. Plunge the lobster in the pan and hold it down with a spoon, return to the boil then lower the heat to a simmer and cook the lobster for 8 minutes, switch off the heat and leave for 2 minutes. Lift the lobster out of the water with tongs and plunge in cold water for a minute, then drain in a colander. After 10-15 minutes when the lobster is cool, crack it open, remove the meat and cut into circular medallions. Place in a bowl with the sliced heritage tomatoes, dress with a touch of olive oil and sherry vinegar. Toss well and serve equal amounts in the middle of each bowl. Top with Greek basil. Finally, Men’s Health Magazine published a lobster bloody mary recipe from the chefs of MC Perkins Cove in Maine, a restaurant which I have written about previously on this blog with regards to their wonderful lobster rolls. 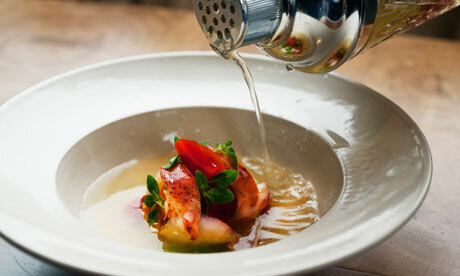 Boil the lobster tail in an uncovered pot for 13 minutes, then plunge it into ice water for 30 seconds. Remove the meat, slice it into medallions, and place the pieces back into the shell. Set aside. Shake the remaining ingredients with 1 cup of ice in a cocktail shaker. Strain into a tall glass with ice. Score the lobster shell width-wise and place it on the glass’s rim.